So you think you can sing? Come out and prove it!! 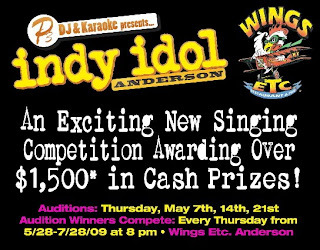 Two local establishments are starting contests in May. Both places have three weeks of auditions and then ten weeks of eliminations. Both contests are being hosted by P3 Productions !!! Being sick is never fun. There is a point where your body just needs to recover. Staying home and spending some quality time on your couch. If you find yourself in that position, The Slums of Beverly Hills is a great choice. It is a perfect sitting around the house movie. The Slums of Beverly Hills follows a family of "nomads" that bounces from low one rent apartment complex to another. Their luck seems to change when Viv (Natasha Lyonne's ) crazy cousin comes into the picture. Her rich father pays Viv's dad to keep his misfit daughter and get her into nursing school. Things are actually looking good for the family, but we all know this is just train wreck waiting to happen. It is silly, funny, dysfunctional, and at times deep. However, it isn't too deep that if you nod off for a minute or two you will be lost.